The Folder Diff Window enables you to compare two folders and quickly see all of the differences between them. It shows you which files and folders are present in both or only present in one. It also shows you which files are different and optionally which are equivalent or identical. You can use this, for example, to compare two versions of a software project and quickly see an overview of the changes between them. 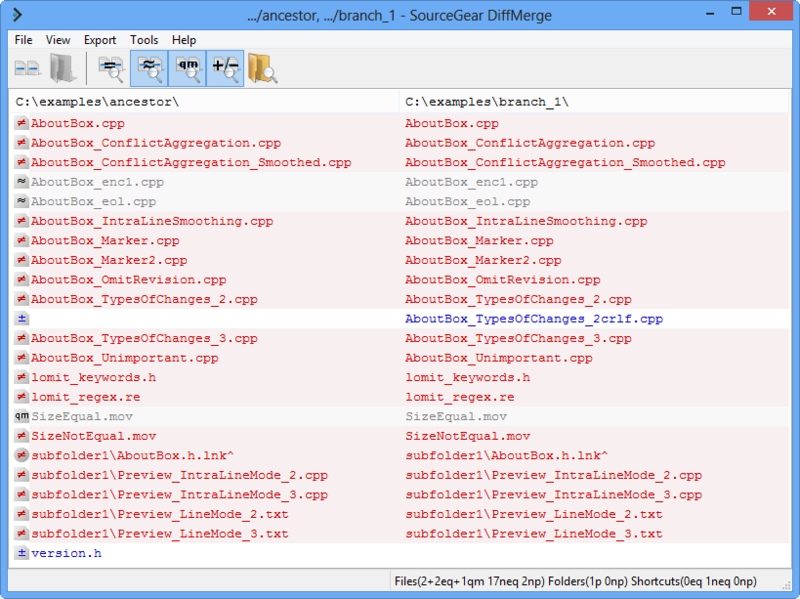 You can then click on an individual pair files to open a File Diff Window and see how the files have changed. The Folder Diff Window is a recursive listing; it examines all files contained within the given root folders and all sub-folders regardless of how deeply the folders are nested. Producing a listing in a large folder tree can take a significant amount of time. There are various Show/Hide commands to let you limit the clutter in the window and concentrate on the important items more easily. Filtering options are available in the Options Dialog to filter out generated and other uninteresting files and sub-folders.